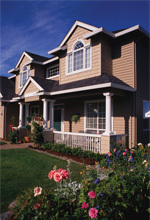 Double hung windows are most common in homes today. They consist of one or two windows placed directly next to each other and are most traditional in style. Double hung windows can be easily cleaned from the inside of your home by adjusting a latch and pulling the window inward. 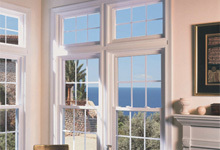 Our double hung windows are made from the most durable glass, making it scratch and break resistant. They are also incredibly energy efficient preventing the transfer of hot and cold air from seeping in and out of your home. This energy efficiency will help keep you and your family more comfortable inside your home and can also help lower energy costs by up to 30%. These wonderful windows over time can help pay for themselves! The installation process is easy and hassle free. Our design consultants can give you a free in-home consultation and review all of your options making the process fun and less overwhelming as you may think. Our hired employees are professional, trustworthy and punctual. We do not hire sub contractors. We offer warranties on all of our windows and can give you information on the Government tax rebate program which can save you up to $500 on replacement windows. Call us today to get started or request a free in-home design consultation and a representative will be in touch with you shortly.